Characterized by dense forests of lush, green vegetation, the Congo Basin is one of the most species-rich habitats of the world. 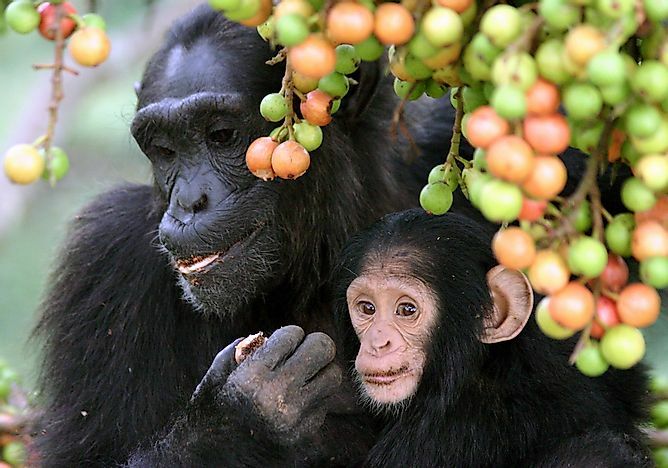 A mother chimpanzee with her child in the forests of the Congo Basin. One of the wildest places in the world, the savannahs, swamps, rivers, and forests of the Congo Basin house some of the rare and elusive creatures known to us. Territories of six countries, Democratic Republic of the Congo (DRC), Gabon, Equatorial Guinea, Central African Republic, Cameroon, and the Republic of Congo lies within the Congo Basin region. The place is teeming with wildlife like gorillas, chimpanzees, bonobos, forest elephants, and many other creatures, large and small. 30% of the 10,000 species of tropical plants here are endemic to the region. 400 species of mammals, 700 fish species, and 1,000 species of birds also live in the Congo Basin. The Congo Basin also has been inhabited by humans for more than 50,000 years and currently sustains over 75 million people including people of about 150 ethnic groups. Sadly, it is the activities of these human inhabitants of the Congo Basin that has threatened the life of the flora and fauna residing here. The Congo Basin is one of the most threatened habitats in the world. Years of civil war, political unrest, illegal mining, logging, poaching, and pet trade industry are highly active in this region. 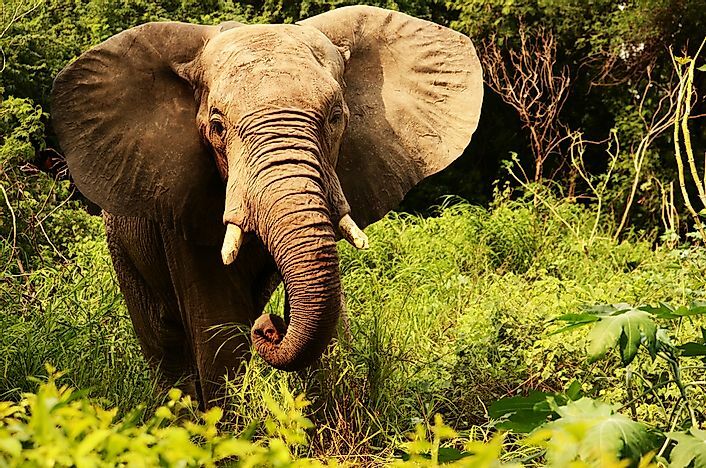 Here, we take a look at some of the iconic species of the Congo Basin and inspect the factors threatening the continued survival of these animals. With a population of only about 200 to 300, the cross river gorillas (Gorilla gorilla diehli) are on the verge of extinction. This gorilla subspecies has subtle differences from the western lowland gorilla in the skull and teeth structures. Unfortunately, these cross river gorillas reside in a region that is highly susceptible to deforestation and poaching. Loss of even a few individuals can prove to be catastrophic to the species. Efforts at protecting these animals are aimed at securing the forests inhabited by the animals and involving locals in the conservation of the species. The small population of the cross river gorilla is also susceptible to inbreeding and a consequent loss of genetic diversity. A critically endangered eastern gorilla subspecies, the mountain gorilla (Gorilla beringei beringei) is found in two small populations. One of these populations lives in the Virunga Mountains and the other in the Bwindi Impenetrable National Park in Uganda. The critically endangered subspecies number only around 880 and are thus on the verge of extinction. Years of war, poaching, habitat loss, and disease have wreaked havoc on the mountain gorilla populations. 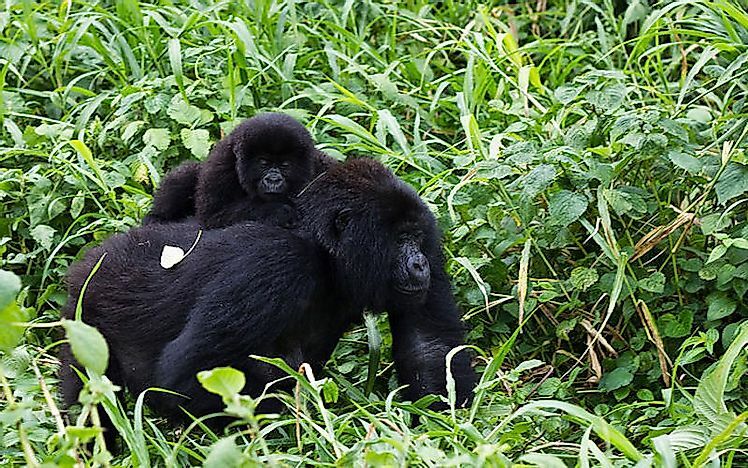 The mountain gorillas live at elevations of 8,000 to 13,000 feet. They possess thicker fur than other great apes, a feature that helps them survive the cold climate of their habitat. Due to human encroachment on their land, the gorillas have been pushed further and further up the mountains, and that has rendered them highly susceptible to dangerous climatic conditions and other threats. The illegal charcoal industry operating in the Virunga National Park has also caused a great loss of precious mountain gorilla habitat. The civil war in the region has further dampened the mountain gorilla conservation efforts. Also an endangered species, chimpanzees (Pan troglodytes) have a surviving wild population of only about 172,700 to 299,700. These animals are our closest relatives, sharing about 98% of our DNA. The chimpanzees live in the central African forests with a significant population in the Congo basin. These primates spend most of their time on trees and when on ground, they usually travel on fours and occasionally only on their legs. 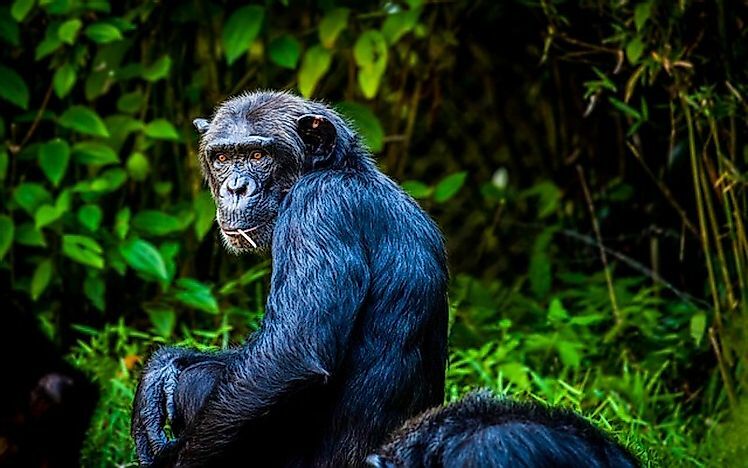 The chimpanzees of the Congo basin are currently highly threatened. Ebola outbreaks have killed tens of thousands of these animals while illegal wildlife trade has decimated the population over many years. Poaching for bushmeat and capture for the illegal pet trade market are rampant in the region. Classified as critically endangered, the eastern lowland gorilla (Gorilla beringei graueri) is another iconic species of the Congo Basin. Also known as the Grauer’s gorilla, it is the largest known subspecies of gorilla. Unfortunately, the eastern lowland gorilla has been subjected to adversities arising due to years of civil war and unrest in the DRC. In the last 50 years, the range of the species has drastically reduced from 8,100 square miles to only 4,600 square miles, and it occupies only 13% of its historical range in the present day. Further, the violence prevailing in the gorilla habitat has prevented researchers from conducting thorough surveys about the current status of this species. The civil unrest has also left the gorillas highly vulnerable to poaching, and their habitat to illegal logging activities. Illegal mining is also highly prevalent in the region. A quick turn of the situation is thus required if these gorillas are to be saved from extinction. The critically endangered western lowland gorilla (Gorilla gorilla gorilla) is the most widespread and numerous of the gorilla subspecies. The gorillas reside in some of the densest and most remote forests of the Congo Basin and adjacent areas. This fact makes it difficult to study them. These gorillas are slightly smaller in size than the other subspecies and are distinguished by their auburn chests and brown-gray coats. They also feature smaller ears, wider skulls, and more pronounced eye ridges. Poaching and disease have led to a more than 60% decline in the population of western lowland gorilla in the past 20 to 25 years. Adult gorillas are killed off to steal babies for the illegal pet trade market while the animals are also poached for bushmeat. 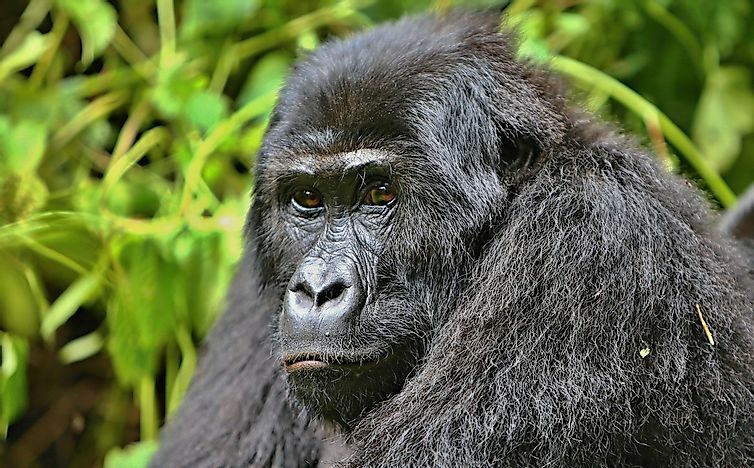 The deadly Ebola has also recently wiped out nearly one-third of the gorilla population. An elusive subspecies of the African elephant, the forest elephants are found in the densely wooded forests of the Congo Basin and some other parts of Central and West Africa. These elephants are smaller than savannah elephants and have straighter and downward-pointing tusks and more oval-shaped ears than their savannah counterparts. Certain other anatomical differences also exist between these two subspecies of the African elephant. Poaching for ivory and bushmeat kills these elephants in great numbers. Governments of the countries where these elephants live lack sufficient resources and financial means needed to ensure the survival of these animals. Add corruption to this, and it spells disaster for the forest elephants. The pachyderms are also suffering from habitat loss and fragmentation and consequent human-elephant conflicts. Classified as endangered, only about 10,000 to 50,000 bonobos (Pan paniscus) remain in the wild today. Bonobos are a primate species that share a close relationship with chimpanzees but are only shorter, darker, and leaner than the latter. These animals share 98.7% of their DNA with humans. The bonobo communities are more peaceful than that of chimpanzees and are led by females. Wild bonobos are endemic to the forests south of the Congo River in DRC. The species, earlier referred to as pygmy chimpanzees, were classified as a separate species in 1929. Civil unrest in the region where the bonobos live has exposed the bonobos to criminal activities and death. Hunting is rampant in the region and is often sanctioned by the military. Bonobos are also hunted by locals for bushmeat, captured to be kept as exotic pets abroad, and also killed for traditional medicine preparations. Habitat destruction also threatens bonobo populations. Fluvial Landforms: What Is An Endorheic Basin? What Is The Back-arc Basin?